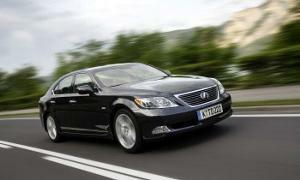 Lexus LS has won the award for Best Luxury Car in the 2007 Fleet World Honours. The trophy was presented at a special ceremony held at the Royal Automobile Club, Pall Mall on Thursday 17th May. The Fleet World Honours are presented annually to those motor manufacturers and service companies who have, in the opinion of the judges, achieved the highest possible level of excellence in their sector. The judging panel is chaired by industry professional, George Emmerson, who has managed fleets at IBM, NHBC and Black Horse Agencies. Members of the judging panel include Ken Rogers, John Kendall, Natalie Wallis and Ross Durkin from Fleet World’s editorial team, Alan Cole of Glass’s Guide and fleet manager Jackie Pomfrett. Residual value, maintenance cost and reliability data is also provided by ALD Automotive, Hitachi Capital Vehicle Solutions and ING Car Lease.